Libraries need to develop standards by which they can assess their individual performances in a larger context, and Assessing Reference and User Services in a Digital Age makes significant contributions to this ongoing discussion. The book addresses its subject matter via approaches ranging from case studies of individual libraries to general discussions of best practices. The contributors explore the impact of the Internet on the field of evaluation, focusing on electronic reference and instruction. They highlight current issues, present research results, and offer expert advice on how to assess online reference and instruction. All chapters are well referenced to facilitate further study, and many include tables, appendixes, checklists, and other helpful features that make difficult information easy to access and understand. The chapters that make up Assessing Reference and User Services in a Digital Age are as rich and varied as the backgrounds of their authors. Experienced researchers provide the results of studies conducted to determine the nature and effectiveness of the online reference services offered by various libraries. Practitioners and administrators from different institutional settings (academic libraries, public libraries, consortiums, etc.) provide their perspectives on the issues facing librarians who need to assess the electronic services they provide. 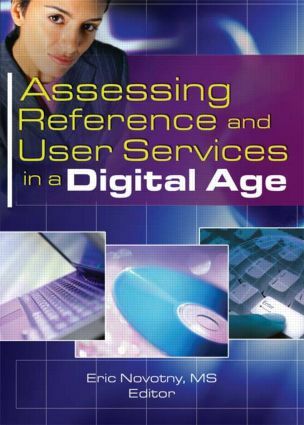 Assessing Reference and User Services in a Digital Age is designed as essential reading for library administrators, public service librarians, and researchers. It provides general advice for practitioners as well as an examination of research results and methodological issues. We urge you to consider making it part of your professional or teaching collection today.